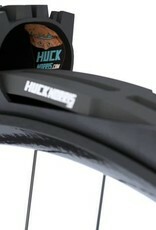 Huck Norris’s mission is to eliminate the fear of wheel and tyre damage. They aim to put the mountain bikers mind at ease so that you can concentrate on your riding and not worry that your tyre will get punctured or your carbon rim might get destroyed. If you want more protection from pinch flats in your tubeless setup, you can add material to sidewalls of the tyre, but that stiffens the casing and results significantly more rolling resistance. We added the material inside the tyre, so that it has no impact on rolling resistance, and material is exactly where it needs to be to dampen hard impacts to the tyre, making it light, simple and efficient.